Do you want to see the market? Let’s look at some specific price ranges in a few local counties. I know many readers are outside of Sacramento, so I’m curious if these trends are anything like your market. Overall inventory declined this past month, which is common during Spring. Properties are still selling quickly, though definitely not as fast as last year. Quick: I suggest scrolling down to your primary county and taking a minute to digest the latest trends. Or check out my video with commentary here or below. Talking Point: Inventory is very thin in Sacramento County right now and properties under $300,000 are tending to sell more quickly than higher-priced listings. Remember too there are many more listings and sales in Sacramento County each month compared to many surrounding counties. 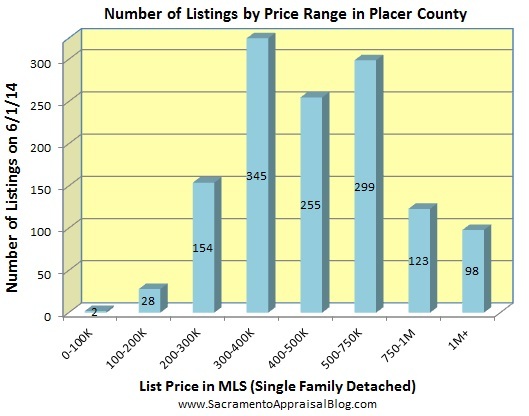 Talking Point: Inventory is a tad higher in Placer County compared to Sacramento County, though it is still very low. There really isn’t much for sale under $300,000 when looking at the entire market. High dollar homes are definitely taking longer to sell than the lower half of the market (which is normal). Talking Point: The higher the price, the longer it took to sell last month (generally speaking). Listings below $200,000 are definitely shrinking. Have you noticed how the quality of homes available at the low end has really changed over these past months? Options for first-time buyers to get into a good quality home under $200,000 have definitely diminished lately. More Placer County by Request: I’ll be sharing a bit more Placer County trends in light of many requests. I’ll also be taking a wider focus at times to discuss the overall market in Sacramento, Placer, Yolo & El Dorado County. Graphs will always be clearly labeled. Sound good? Question: What stands out to you from above? Let’s look at three trends today. Instead of only unpacking Sacramento County though, let’s glance at the region as a whole to understand larger dynamics at hand. I hope this will help give you a few more real estate talking points, whether for conversation with friends or clients. Any thoughts? It’s not earth-shattering news that properties are spending more time on the market these days compared to last year. It’s simply one of the byproducts of having more housing inventory. Keep in mind 47 days is actually really quick considering sales in March 2012 took more than 80 days. The Sacramento Region had just above one month of housing supply for an entire year. Inventory began to increase when interest rates shot up from 3.5 to 4.0% between May and June 2013 (and investors also began exiting the market around this time). It’s easy to get sensationalistic about a stat like this, but remember that current inventory is still VERY low. Sales volume has been really low lately. The first quarter of 2014 was down 17% in sales volume when compared to the first quarter of 2013 and 25% from the first quarter of 2012. As you can see above, cash sales are an X-factor for why volume has been low, and the market has been feeling the impact. This is true in Sacramento County, and it’s true when looking at the region (Placer, Yolo, El Dorado & Sacramento). BONUS: The first quarter of 2014 saw a 44% decline in cash sales compared with Q1 2013. A quick video of where the market is. Watch below or here. Sacramento Bee Quote: By the way, I wanted to share that I was quoted in a SacBee article last week entitled Sellers’ market has few sales. That’s always an honor. Thank you to anyone who clicked over from the story or even subscribed. I really appreciate you being here, and I’m looking forward to talking together. Questions: What stands out to you above? What are you seeing in the trenches of the local market? I’d love to hear your insight. Comments are welcome below. How will you know when the market starts to decline? Property values are definitely increasing right now in the Sacramento area, but at some point in the future they’ll cool off or decline. Whenever that happens, what should we be looking for to capture the decline when it first starts? What will be the indicators of a slow down or declining trend? I asked a handful of experienced Realtors and investors in the Sacramento area, and here is what they said. Any thoughts? Sarah Bixby – Realtor: There are 3 fairly clear indicators to show the market is in decline. Firstly, the buyer competition becomes less fierce. Instead of competing against 8-10 offers, you may only have 1 or 2 to compete with. Another sign of decline is longer DOM. If houses start sitting on the market longer this is another indicator that buyers are not purchasing or there is too much inventory available. The 3rd and most obvious indicator of a downward market is decreasing home values. Jeff Grenz – Broker: For my business, I look to “hits” and “phone traffic” as leading indicators. For building homes, the phone stopped ringing around 2007 for quite a while. You don’t recognize the Wile E. Coyote moment – that the business model has changed – until a few months have passed, then trends might show up in employment growth, which drives our long-term real estate market. Signs of an impending multi-year decline in the Sacramento region where government is our main industry would be some combination of two or more of these: • Major CA budget fiascos, creating layoffs, program cuts into the schools and local programs, etc. • Declines and/or slow downs in the Bay Area market, whose excess equity feeds ours. • Military action, prolonged on multiple fronts. • Hard cut offs or reversals of programs that send $$ to our market (FED quantitative easing, HARP, FHA..etc.). In most cases, these indicators will predict or precede employment, housing sales and the stats we’ll get 12-18 months later. Eric Peterson – Praxis Capital: I think when you’re trying to take the temperature of the market it’s as much art as it is science. We track a lot of data on a weekly basis at Praxis, and to me the best indication of a declining market is inventory. When you start to see that number grow you know you’ve got a market with more people selling than buying and that is inevitably going to affect pricing in an adverse way. That’s the science side. As far as the art of understanding market trends, I pay very close attention to what our resale agents are saying about the homes we have on market. Are they getting a lot of phone calls? Is traffic good? How are our days on market? These clues are often the leading indicators to where the market is going and will often signal a declining market well before the data lets you know something is wrong. Zoritha Thompson – Broker: My key Indicator of a slow in the market would be inventory of homes for sale. Currently with a lack of inventory, buyers are scrambling just trying to purchase a home and are making offers over the list price, which in turn makes prices increase. When there is more inventory it becomes more competitive and keeps prices level or may move prices lower. Prime example would be if the hedge funds put their inventory of homes on the market at the same time, this could cause prices to move downward. Another key indicator would be “Days on market” (DOM) climbing higher which means the market has reached a peak and may be coming down. I have been seeing a slight trend of homes coming on the market that are way over priced, they are just sitting there with no offers. Warren Adams – Realtor: I believe today’s market is strongly dictated by low inventory and interest rates. An increase in interest rates will also increase inventory and most likely put us back to a more “normal market”. Today’s MLS notes that there were 122 new listings with the last 24 hours and 158 pending sales in the same time period which shows homes continue to sell quicker than they are coming in. What does the data say? These are fantastic responses above, and the two graphs below help illustrate how inventory and DOM (days on market) can help show what a market is doing (declines in both have been indicative of increasing values). Questions: Do you think the decline will be well publicized when the market does take a turn? With the massive use of social media, will the media and real estate community catch it (and report it) when it begins to happen?